People screamed and ran, as armed men loyal to Ajaria's leader Aslan Abashidze dispersed protesting students and teachers in Batumi, the capital of this renegade province of Georgia. They used water cannons and chased the demonstrators, beating them with iron rods and wooden batons. Dozens of people have been taken to hospital, some are reported to be in a critical condition. Aslan Abashidze's top security man, Jemal Gogitidze, watched the soldiers from the blackened windows of his car. He refused to speak to the BBC. "Look what they are doing to us. These are not people! They are beating kids, they are beating women," screamed Ana, a 35-year-old teacher from one of Batumi's schools. Like some 200 other people, Ana took to the streets in protest of Mr Abashidze's decision to close schools and universities across the province. 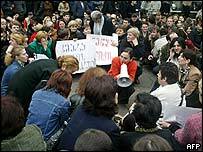 The demonstrators were also urging Mr Abashidze to disarm his paramilitary force, lift the state of emergency in the province and restore road links with the rest of Georgia. The demands of Georgian President Mikhail Saakashvili are identical. On Sunday Mr Abashidze sealed off this lush Black Sea province from the rest of the country by blowing up bridges. Stepping across stones is now the only way to the region - although not everyone is allowed in. Mr Abashidze's armed forces keep a tight control of the border. All of the traffic has been paralysed, and lorries carrying good from neighbouring Turkey are turned back. Locals complain of rising prices and the Georgian government says Ajaria is on the verge of a humanitarian catastrophe. "He is a real dictator, a real dictator, what is he going to do? Starve us to death?" said one Batumi resident of Mr Abashidze. "Every member of the Abashidze family has a Mercedes, they've made money all of us. Every third person here has a gun, because they gave them out," another demonstrator complained. Opposition members say their offices and homes are being raided and that several of their activists have been detained. "The people of Ajaria should be able to elect their own leader. We will not step back until our demands are met," said Tamaz Diasamidze, leader of the opposition movement Our Ajaria. But Mr Abashidze is also refusing to step back. He says the government in Tbilisi is preparing for war, and that he has to defend the province. On Sunday Mr Saakashvili gave the Ajarian leader 10 days to disarm his private militia. Mr Abashidze has rejected the ultimatum. His forces continue to patrol the streets of Batumi and roads leading into the town are blocked. 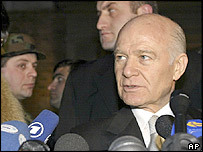 He ordered all of Georgia's television stations off air, and closed the sea space, banning Georgian ships from entering Batumi port. It seems that the bridges for a peaceful solution have been burned. "Aslan Abashidze lost his last chance of a peaceful dialogue," said Nino Burjanadze, chairwoman of the Georgian parliament. Many in Ajaria say they are fearful of war. "The situation in the renegade Ajaria region continues to deteriorate"